The 53 meter long cargo vessel Hong Xing 88 sank in the East China Sea off Wenzhou, China. The Hong Xing 88, loaded with a cargo of sand, dropped anchor in order to ride out Typhoon Haima. The typhoon was too severe and the Hong Xing 88 suffered uncontrolled water ingress. The vessel requested assistance as it sank. The 7 crew on board climbed to the top of the cargo vessel’s superstructure as the Hong Xing 88 sank. 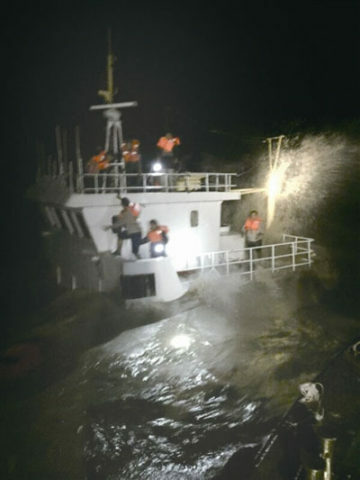 All 7 men were later rescued by the China Coast Guard. No reports of injuries.